With major fabrication workshops in Brisbane and Townsville, we are able to service a wide geographical region and ensure access to key manufacturing resources and transport hubs at all times. Our Brisbane facility, located in the heart of the Western Suburbs industrial precincts, offers specialist fabrication services and precast facilities, together with 32,000m2 of hard stand and excellent access to major transport corridors and the Port of Brisbane. Our Townsville facility offers 6000m2 of undercover fabrication workshops, with 6 overhead cranes capable of up to 63 tonne single lift capacity. 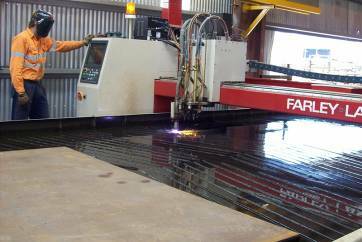 The workshop is fully equipped to handle all steel fabrication, assembly, welding and machining functions. With the support our Quality Manager and logistics coordinator, our Workshop Managers utilise a comprehensive QA System to facilitate our planning, procurement, fabrication and delivery whilst ensuring the project outcomes are met with high levels of traceability. CASA works closely with reputable and reliable steel merchants, steel painters and galvanisers with whom long-term business relations exist. Our qualified resources have contributed to and utilise our vast library of weld procedures, manuals, testing and certifications templates that are compliant with current building standards and legislation.